A US National was murdered on Ambergris Caye sometime between the night of Saturday, November 10th and Sunday November 11th on northern Ambergris Caye and The Belize Police Department is looking for computer anti-virus pioneer John McAfee for questioning as part of the investigation. Fifty-two year-old Gregory Viant Faull, a retired American from the state of Miami, Florida USA was found dead by a housekeeper inside his living room with an apparent gunshot wound to the back of his head. The incident took place some six miles north of the populated town of San Pedro on Ambergris Caye in the Mata Grande Area. As a result of the ongoing investigation, police in search of McAfee, found an arsenal of ammunition inside his beachfront property on northern Ambergris Caye. According to the National Belize Police Press Officer Rafael Martinez, 39 year-old Laura Tun, a housekeeper of the Boca del Rio area of San Pedro Town arrived at around 7:20 AM at Faull’s residence to conduct routine house cleaning. Tun told police that after she entered the house, she noticed Faull in a motionless state and lying on the floor of the front living room. When Police arrived at the scene of the crime at the second floor of a two-story concrete home situated on the beach area in the Mata Grande area, they found an expended 9 millimeter shell at the second stairs of the step situated on the southern part of the outer part of the building. They also found Faull inside his living room situated in the middle of the building with an apparent gunshot wound to the back of his head. Police claimed that no possible motive has been established and San Pedro Police confirmed that there were no visible signs of forced entry to the building. As part of the investigation, Belize Police investigators has processed the scene three times, the last was on Tuesday November 13th where two US investigators were brought into the country to assist in the investigation. “There are certain things that need professional assistance as part of the investigation,” said the Officer Commanding San Pedro Police Department Assistant Superintendent of Police Viennie Robinson. One of the areas police are trying to positively determine is to see in which part of the building Faull was shot since the expanded shell was found on the step outside the building while Faull was found dead inside his living room. Police say that although there was no sign of forced entry, a laptop computer and an iPhone were discovered missing. Residents in the area told The San Pedro Sun that Faull had several misunderstanding with his neighbor John McAfee, who lived about 300 yards apart. Some neighbors said they believe that the dispute may have escalated to the shooting. According to the neighbors, Faull’s concerns as it related to McAfee are also concerns shared by other residents of the Mata Grande area. According to the neighbors, McAfee’s armed security had been intimidating them while walking along the beach infront of the beach next to McAfee’s property. Residents claim that McAfee has also been intentionally setting his vicious dogs at residents from the area that use the beach to access restaurants in the area; something that made residents like Faull upset. Mayor of San Pedro Town Daniel Guerrero confirmed to The San Pedro Sun that a complaint was made to the municipality in writing expressing the residents’ concerns. William Mulligan - arrested and charged for kept firearm and ammunition without a gun license. 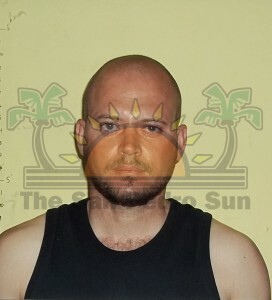 The Head of the Gang Suppression Unit (GSU) of the Belize Police Department Mark Vidal also explained to The San Pedro Sun that they are looking for McAfee as part of the murder investigation. Vidal said that when a team of officers descended on McAfee’s resident, no one was found. However, Police found on McAfee’s premises four pellet air riffles, one 12 gauge Remington pump action shot gun loaded with seven 12 gauge Aguilla brand cartridges, one 12 gauge single action shot gun Baikaz brand loaded with one 12 gauge Eley brand cartridge and a belt containing twenty two 12 gauge Aguilla brand cartridges. The third 12 gauge shot gun was license to McAfee. Present at the time of the search was McAfee’s body guard British national 29 year old William Mulligan and his Belizean wife 22 year old Stefanie Mulligan. Police has since charged both for 2 counts of keeping a firearm without a gun license and one count of keeping ammunition without a license. The couple has appeared before the San Pedro Magistrate Court and because there is no bail for gun related offences in Belize, they have been remanded to the Belize Central Prison. According to investigating Officer Police Sergeant Jaime Gonzalez who is attached to the San Pedro Police Formation, two other Belizeans have been arrested. Eddy Ancona and Alberto Chaccon were both charged for one count each of lending a firearm without a written permission from the Commissioner of Police. The charges came because the two guns for which McAfee’s body guard could not produce license were in the names of the two individuals. Stefanie Mulligan - arrested and charged for kept firearm and ammunition without a gun license. McAfee has been in hiding since Sunday November 12th. The San Pedro Sun revisited the scene of the crime on Tuesday, November 13th and spoke with a groundskeeper who works for McAfee. The individual, who prefers to remain anonymous, told The Sun that he was unaware of what had happened the day of the murder until he arrived at work late that afternoon. “I got here to work and everyone was gone, just one guest was left here, I don’t know where they all went but it is my job to keep an eye on things and I will continue to do so.” The individual did confirm to The Sun that police had returned to the McAfee property that morning in search of a specific gun. He could not confirm if they had found what they were looking for. On Monday the 12th San Pedro Sun editor, Tamara Sniffin left a phone message for McAfee requesting an interview. On Tuesday just as she was returning from northern Ambergris Caye, McAfee returned the call and spoke with her on her cellular phone. 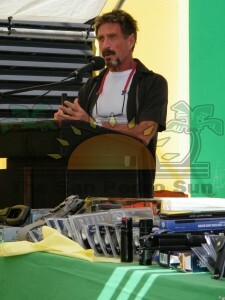 In closing McAfee claimed that he is still in Belize but is moving around frequently. Speaking to the press on Wednesday November 14th PM Barrow explained that he is surprised at McAfee’s statements. “I don’t want to be unkind but it strikes me that he is extremely paranoid, in fact I would go so far as to say that he has gone bonkers. My understanding is that the Police want to interview him in connection with their investigation. It is not even as though the police have said that he is a suspect and certainly there is no question at this point of charges pending. The proper thing for him to do, I don’t care how rich he is, he is not above our laws, is to go and speak to the police. This nonsense about him that the police wanting to do him harm is obviously blatantly untrue. But even if it was so, the fact that it is smeared all across the international headlines would mean that the Police would have to act extremely cautiously in the full glare of the public spotlight; that is the best possible safeguard that I can have that there would be no abuse in terms of the interview process that the police has a duty to conduct with him. Mr. McAfee, I hope has proven by his utterances and his behavior is not anybody to be taken seriously with respect certainly to the defamation campaign on which he has now embarked against this country and its officials,” said PM Barrow. McAfee’s public statement to the media has put a different spin on the murder of Faull, which has captured the attention of many international media. According to Belizean authorities, McAfee is only wanted for questioning and asking anyone with information about McAfee’s whereabouts to call the nearest police station.